Micro homes are tiny houses, and an exciting new trend in housing options. I define them as ones with less than 500 square feet. Why have more house than you need? A little place is cheap and easy to own and maintain. Consider a micro home. The micro homes of the Tumbleweed House Company have received a lot of attention over the last few years. Jay Shafer has done a good job promoting the benefits of living in really tiny houses. His website offers small house plans ranging from 50 square feet to 500 square feet. All are designed to be fully liveable, with bathroom and kitchen designed into tiny spaces. Minim Micro Homes sells plans for a tiny 210 square-foot house that looks quite liveable. It features big windows, pull-out bed with full mattress, kitchen, bathroom, dining table, seating for 7, and a closet. SIP construction for superior insulation. If the construction process is overwhelming you, consider a prefab. 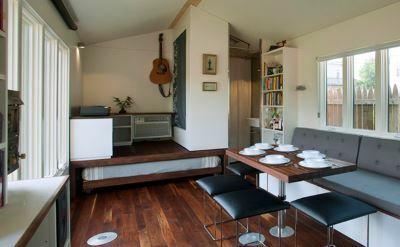 The IdeaBox "northwest" model is a modern 400-square-foot prefab tiny house. A clever simple design. The "mini box" model is 384 sq ft. Just add furniture and move in. The kitHAUS modules are fantastic. 117-square-feet to 289-square-feet aluminum-framed modular that can stand-alone or combine for larger structures. This is the future of housing innovation -- strong, efficient, easy-to-assemble kits of parts. If these go into volume production, prices could fall substantially. 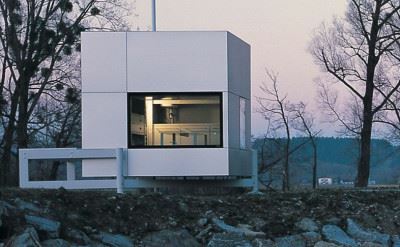 How about the miniHOME prefab modular home? The Solo 40 (480 sq ft) and the Solo 36 (475 sq ft) are attractively modern and efficient designs. The BluHomes Origin is a modern pre-fab home. 461 square feet. The design boasts eco-materials, energy efficiency and water conservation. The micro compact home is a clever little living-space built in Germany. The tiny box is a fully-functioning home and has been used to house college students. The Crib is a famous design for a clever micro mansion. 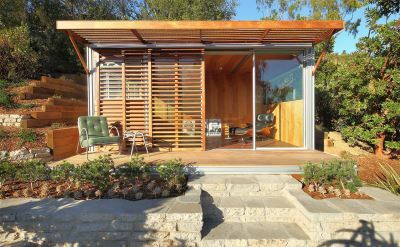 Steel bents, structural insulated panels, and a big roll-up glass door make this 250-square-foot prefab unique. 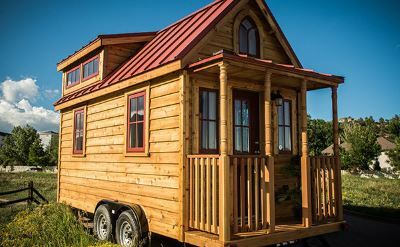 Tennessee Tiny Homes company makes mobile homes from 84 to 192 square feet. Most are 8 feet wide but clever layouts make it work. 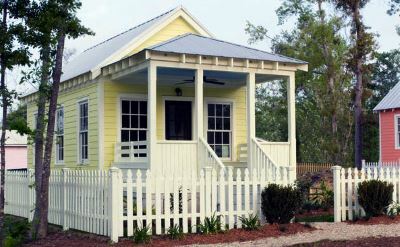 Katrina Cottages are small, high-quality house designs born out of post-Hurricane-Katrina housing needs. They have really nice plans for fans of traditional architecture, including 308-square-foot and 416-square-foot versions. Another good source of micro house plans is Sheldon Designs. They offer cabin and cottage small house plans from 192 square feet and up. I bought their 12 x 16 micro-cabin plan and hope to build it some day. Here's a plan for a 320 square foot 1-bedroom home. Its extremely simple design would be easy to build. Ross Chapin Architects has tiny house plans from the 307 sq ft Blue Sky Cabin to the 449 sq ft Backyard Cottage. These are beautiful designs for micro homes you can be proud of. 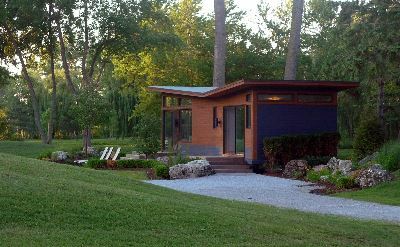 Escape Homes offers a 400 square foot prefab home. The design features French doors opening onto a large screened porch, and a wall of windows. Attractive cabin style. I hope you've found these micro house resources interesting and useful. If you want something a little bigger, check out our small house plans. There are options out there -- live in a tiny house if you want to!